What’s “Baby” doing – Waiting for a Jumbo Costa Coffee? Trying to park? Asking for directions back to her herd? Information is intertwined in and drives every part of our personal, national and global life today, and yet, the very concept of “information” is very hard to define because it has so many different meanings that depend on context: data, facts, alternative facts, numbers, algorithms, attitudes, patterns, weights and measures, to name a few. The best general definition I ever heard was this: “Elephant in a Parking-Lot. This was the answer given to me by the head of AI research at Cambridge University in England almost 20 years ago when I was getting background on a company for acquisition by a client. 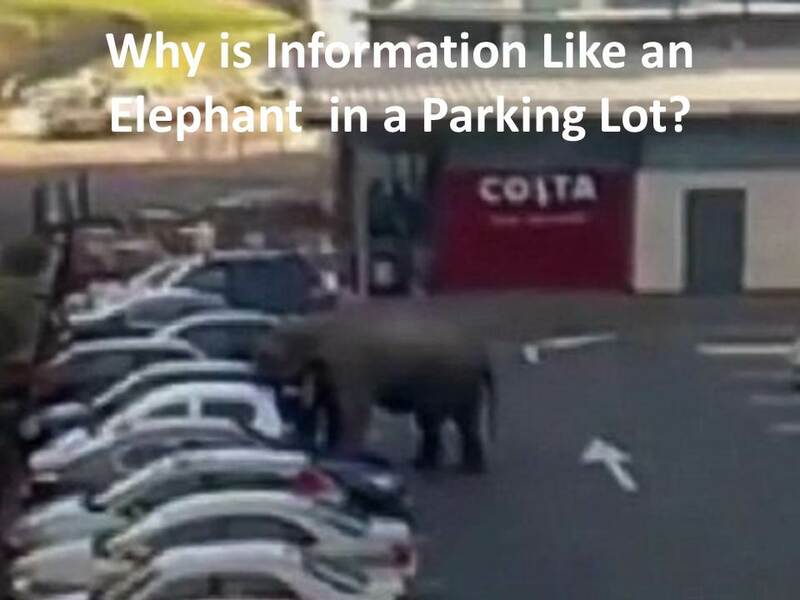 She was a young super smart PhD scientist/engineer who said, “Information is always the answer to a question.” In the case of the ‘elephant in the parking lot, the question is: “Why is it there?” It stands out from normal experience of a parking lot. That’s information,” she said. I commented that in my experience ‘why questions’ rarely yielded absolute truths. She acknowledged affirmatively adding that “good enough” was their goal. I was in Cambridge at a time when the Internet was just beginning to take off and would connect half of the world’s population by social media and iPhones—before the #FrictionLessSociety (FLS) was even a glimmer of reality. Today FLS roars with power growing exponentially to do both good and harm, and it matters greatly whether the “why” answers to information questions are “good enough.” There are natural limitations to what we can know about information. My goal in this essay is to explore the boundaries of these limitations in terms of the relationships of information with energy, matter and math in order to develop a clearer understanding of the fundamental nature and impact of information in the FLS. We are all (including me) living in an intangible information society we don’t really understand because we have never experienced it as a way of life in human history before now. Just the fact that “information” has no face, no allegiance, no fingerprints and moves invisibly throughout society telling our machines and us what to do next at the speed of light should give us pause to reflect seriously on what information is and how it is fundamentally changing our lives. If we don’t develop a shared basic understanding of the information world we live in how can we ever know when answers to information questions are “good enough?” The core problem is that information is both abstract and concrete, and humanity has only lived in the concrete world of objects. Put simply, we have lived in a “thing” society throughout history until very recently. By “thing” I mean tangible things we can touch, handle, move, and assemble to make into other more complex things like machines, cars, buildings, and products of all kinds. At a scientific level we experience things as other living things and as “dead” material things like oxygen, carbon, copper, oxygen, uranium etc. that make up living and non-living things. We have even made things that extend our senses to very large distances to see the structure of galaxies billions of miles from earth, as well as to the very small to see the structure of matter at a billionth of a meter. We are all aware of these things, but we are not aware of slipping into the fundamental new reality of intangible information. OUR EVERYDAY EXPERIENCE WITH REALITY IN THE PAST HAS BEEN WITH TANGIBLE THINGS, WHICH WE ARE NOW ABLE TO MANIPULATE AT THE DEEPER REALITY LEVEL OF “INFORMATION” – BOTH AN INTANGIBLE AND A TANGIBLE REALITY. An example of intangible information is Einstein’s famous equation E = MC2, or the information math rules of “energy equals mass times the speed of light squared.” Tangible information is an atomic bomb that we constructed from the intangible information in this simple equation. The deep roots of our “thing view” goes back to the beginning of life itself and can be seen being experienced by a new born baby whose first lesson of reality is learning to distinguish “me” from “not me;” our first and deepest experience of life is a “thing” paradigm! Our dream-machine brain thing is where and how we adapt to these experiences. We need to teach our brains to see the world in terms of information and information patterns if we are to know what is going on in today’s world. This primal first perception of reality as tangible objects is billions of years old and very hard wired into all life. The recurring question we face today is how can we meld the tangible “object truths” we have long experienced with the new intangible “abstract truths” of information that we are now also experiencing, and that are defining our new reality? 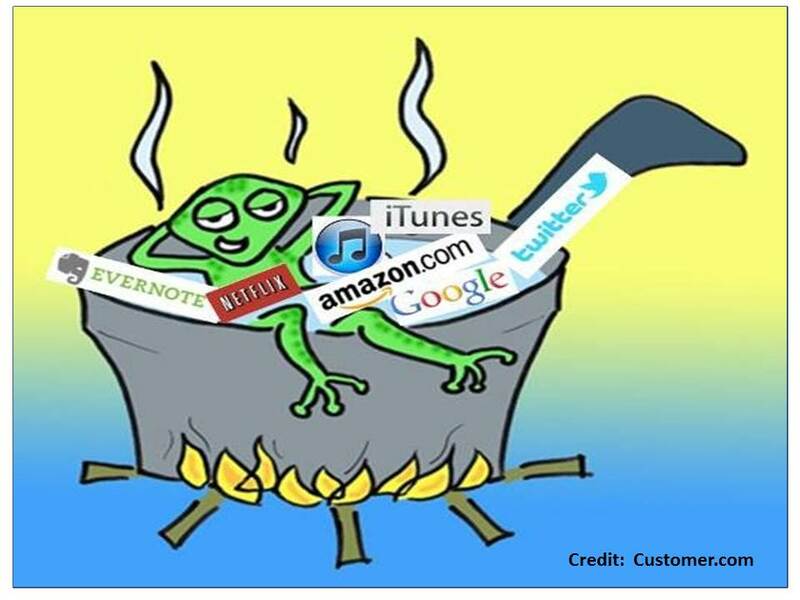 My global answer is it should matter to everyone because we are all (including me) like the proverbial frog in a pot of water heating up to a boil without noticing how hot it’s getting until the water begins to boil; this “water,” as information we are swimming in, has been cooking for over a century and is now heating up fast. It’s not too late to get out and figure out what can be usefully done with this “hot water” without getting burned. It matters personally to me for several reasons. Selfishly, it matters because I have been thriving in the hot water of innovation all my life, usually getting out early enough, and using what I learned to help others adapt to and use innovation to grow and prosper; however, this time feels very different. For the first time in history, information technology is ushering in a #FrictionLessSociety (#FLS) that brings with it the existential power to create new life forms smarter than humans; we already have one technology (nuclear) that we know can destroy all human life as we know it; now we have two existential forces that we might not be able to control. The last great innovation in the 20th century—conversion of matter into nuclear energy—has so far, arguably, been mostly viewed as a destroyer of life. We have been lucky with nuclear so far. I was, as a PhD nuclear scientist at 26; after working at that role a few years, I chose to focus the rest of my life on the side of supporting life instead of destroying it. Lucky me; I went from nuclear to technology services to information technology jumping from the hot pan into the fire. New innovations always come with two sides of the sword – the intended good/bad and untended bad/good. We are now learning how to manipulate matter at its information level. As in the past, society is now doubling down on both sides of the information technology sword—arguably the most powerful innovation in the history of mankind. Having lived through and experienced the evolution of this technology for my entire life, I can’t think of anything more important for me to do than focus my knowledge and skills on helping society get out of the #FLS hot water before it boils.